This page shows data sources used by various weather sites and points out some key facts for the time constrained reader. To understand weather forecasting and weather sites fully we recommend reading the full article HERE . In the forecast model circles, the smaller the number, the better the data. The GFS forecast model produced in America is used by many sites because it covers the entire world and is available for free on the internet. This enables weather sites to operate a single forecast model at low cost and service the entire world which broadens their market. This is not the best forecast data for Australia. BOM’s MetEye has a technical limitation which means it doesn’t show their best data for VIC and TAS. Fish Ranger uses the better data in VIC and TAS. In other states the data sets are the same. ADFD data predicts weather at hourly intervals but MetEye only shows every 3 rd hour, limiting user’s ability to see approaching changes. Fish Ranger shows every hour as the model intends. WillyWeather does use BOM’s ADFD data however their locations are land based and not representative of conditions on the water. Fish Ranger’s forecasts are taken over open water where wind is often stronger. 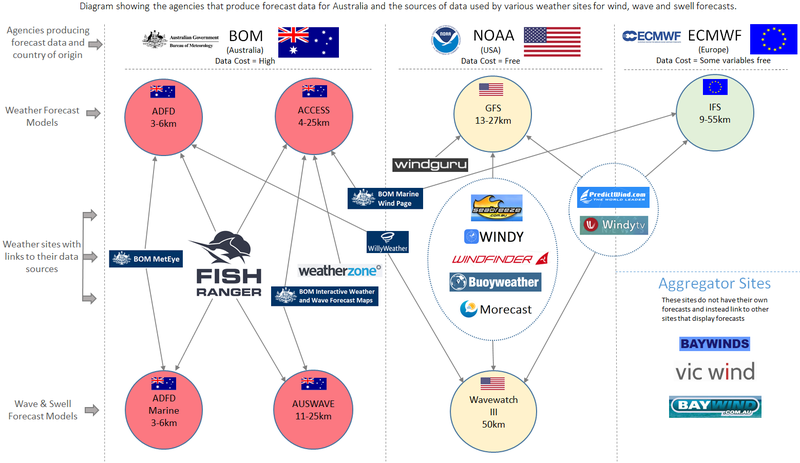 WillyWeather does not use ADFD Marine data and instead opts for the free American alternative. Weather sites do not use formulas and secret algorithms to make forecasts more accurate. Their accuracy is dictated by the accuracy of their base data. Fish Ranger has been engineered to be the best weather site / app in the country. It meets or exceeds every performance characteristic of every other weather site currently in existence, including MetEye. Weather forecasting is not a precise science and forecasts will often be wrong but you need to pick the best forecast data and stick to it, it will be right more often than other data sets.